As the buzzer sounded and the clock hit zero at the Carrier Dome, Michigan State had punched its ticket to the Final Four. Senior guard Travis Trice immediately fell to the ground and began to sob. Three years at East Lansing produced three Sweet 16 appearances, three eliminations in the Regionals, zero Final Four appearances, as well as a health scare related to a mysterious brain infection first identified in 2012 that left him and his family questioning his long-term health, let alone his short-term basketball future. Year four has now produced that almost-expected, yet long-awaited Final Four appearance. After all of those disappointments and uncertainties, no wonder Trice had – and maybe needed – that cathartic moment in front of over 24,000 people on Sunday. “I can’t even put it into words, all the summers, all the hard work, being so close last year, it makes it worth the while,” said Trice, the East Region’s Most Outstanding Player. 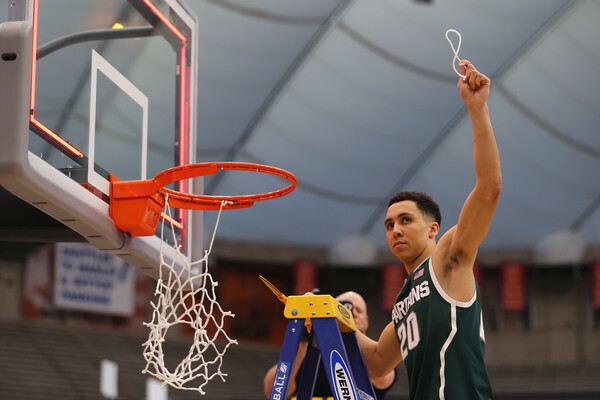 Last year, Trice and the rest of the Spartans were also in the Empire State with a chance to head to the Final Four, but fell to eventual national champion Connecticut in the regional final at Madison Square Garden. That loss broke the streak of head coach Tom Izzo sending every one of his senior classes to the Final Four at least once during his coaching career. Trice is one of three seniors, determined to not have a repeat of last year and seeing the seniors from 2014 go their whole careers without the feeling of scissors in hand, sneakers atop ladder rungs and cutting down nets. He said he knew what it felt like being on the losing side of that equation, and that’s what motivated him and his teammates all season long. Sitting at the podium postgame with the cut-down net around his neck, Trice took a deep sigh of relief. Amidst the team’s midseason struggles, Trice, the son of a coach, also had to fight through the humbling experience of being benched, which occurred after a Spartans’ home loss on Feb. 7 to Illinois where he scored just six points on a 2-for-10 shooting performance. Coming too far to see all of his hard work lead to more March disappointment, Trice responded like the senior co-captain he is, averaging 16.3 points, 4.8 assists and hitting nine of his 19 three-pointers in the team’s next four games, all coming as a substitute. The Spartans won all four of those games, though there were still questions as to whether Michigan State had finally turned the corner or was just hitting another peak before descending towards another valley. Or better put, Trice started playing like an All-American. After a 21-point, 10-assist game in an overtime loss to Minnesota, Trice was reinserted into the starting lineup and subsequently scored at least 16 points in six consecutive games, including at least 20 in wins over Purdue, at Indiana and in the Big Ten Tournament semifinal against Maryland. In the Big Ten final, Trice was held to six points in the overtime loss to Wisconsin. The clunker against the Badgers in Chicago proved to just be a speed bump in Trice’s road to redemption, as he turned up his game even more once the Big Dance commenced. In the third round upset over East No. 2 seed Virginia in Charlotte, he scored 23 points – including 13 of the Spartans’ first 15 – against the team regarded as having the best defense in the country. Off to Syracuse the Spartans went, and Trice followed the performance in the Queen City with 24 points against No. 3 Oklahoma in the Sweet Sixteen. Before the win against the Sooners, Trice had scored at least 20 points in consecutive games just once all season – three weeks prior in those aforementioned wins against the Boilermakers and Hoosiers. On Sunday, he led his team in scoring for a third consecutive game, providing 17 points, including the two free throws that proved to be the final points in a 76-70 overtime victory over Louisville. 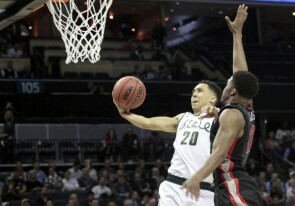 Trice proved to be one of the most composed players of anyone in NCAA Tournament. Well, he was, until the buzzer sounded on Sunday, when he couldn’t hold his emotions in any longer and the tears streamed down his cheeks. Those tears of joy and pain may also turn into tears of motivation as the Spartans head to Indianapolis.